Food Blogga: I'm So Happy. It's Cherry Season. I'm So Happy. It's Cherry Season. For the last couple of weeks, I have been unusually happy. It's not the weather or exercise or Prozac. It's cherries. Here's the deal with cherries: their season is ridiculously short, their price is ridiculously high, but the flavor is ridiculously delicious. Who can deny the pure pleasure of eating a sweet-tart, fresh, juicy cherry? It is prime cherry pickin' time. So here's what you need to know about selecting, storing, and cooking with cherries. Most cherries are in season from late May through late July. The season is short: typically 4-5 weeks, peaking at about week 3. Why are cherries so expensive? For good reasons: Cherries are highly dependent upon good weather; they're also highly susceptible to insect damage and disease and often require protection from netting or cheesecloth, which is time consuming for farm workers. Finally, they must be picked carefully and are highly perishable since they do not ripen once harvested. This all adds up to a labor intensive and expensive fruit to produce, which is why the price is high. Don't wait for a big sale on cherries; it might not come. If you love them --and you know you do -- then just splurge. How do you select cherries? Ripe cherries should be firm, but not hard. The color can range from scarlet to burgundy depending on the variety. In general look for deeply saturated cherries. Discard any cherries that are split, knicked or bruised. How do you store cherries? Store cherries unwashed in a covered plastic container in the refrigerator. They should last 4-5 days. To freeze cherries, wash and thoroughly dry the pitted or unpitted cherries; store loosely in resealable freezer bags. Defrost when ready to use. Frozen cherries will last up to 6 months in the freezer. How do you pit a cherry? You can buy a cherry pitter. Or you can do it the old-fashioned way, like me: Place the cherry on a cutting board. Place the flat side of a wide knife on the cherry and press gently until it splits. Open the cherry and remove the pit. In the car on the way home from the market. Come on, you know you do. But if you have the will power, then wait until you get home to give them a rinse under some running water. Then eat to your heart's content. Cherries are ideal in sweet dishes, such as pies, clafoutis, cobblers, cakes, and ice cream. They also work well in many savory dishes. Try them in salads, chutneys, and sauces, which are wonderful on chicken, duck, and pork. For the vinaigrette, whisk all ingredients in a small bowl and set aside. 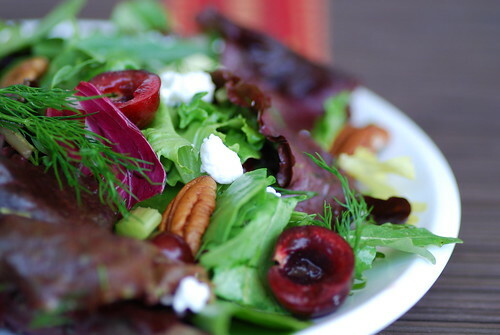 In a large bowl, add the mesclun greens, cherries, and celery. Pour half of the vinaigrette and toss until coated. Divide evenly among four plates. Add crumbled goat cheese and pecans to each plate. Drizzle with the remaining vinaigrette. **White balsamic vinegar is made from white wine vinegar and grapes. Because it is milder than traditional brown balsamic vinegar and doesn't stain food, it's preferable for this watermelon salad. It can be found at specialty markets and most major supermarkets. Rice vinegar can be substituted. The salade looks really colourfull and yumm. Here too the cherris are almost there, the new ones are really expensive so i am still waiting when they sell them in abundence so it is cheaper. I grew up with a cherry tree in my backyard. And that also means I grew up with cherry juice stains on my clothes. My sisters and I spent hours in the cherry tree and eventually, my parents built us a tree house in it. And then sadly, my parent's sold my childhood home and the new owners cut down the cherry tree. It feels kind of sacrilegious. Such a passion for cherries Susan! I wasn't aware they had a short season. Here in Australia it lasts pretty much the full summer. Anyway, I do like to use them in salads and I love how you did the same thing! I just saw one of the local fruit stands (they are on every corner in nyc) with a huge thing of bright cherries. I'll have to pick some up before you post the french toast - yummy!! This salad looks so fresh and beautiful, not to mention healthy too! Can't wait for fresh cherries and blueberies too. We are at the end of strawberry season here. A very eye catchy salad! I too love cherries. In fact, I was impatient and bought some at the very beginning of the season that ended up costing me a small fortune! The salad sounds wonderful and I can hardly wait for the French toast recipe! Oh I know, they are expensive. I'd splurge if i could find any organic cherries. Right now all I've found are conventional. Maybe if bugs are big problem with cherries like you said, that explains why finding organic may not happen! Lovely photo! And the recipe sounds delicious - especially the combination of cherries and goat cheese. I love fruit's in salads and your's looks excellent. I just bought Rainier Cherries in Monterey for $2.99 lb, unheard of and HEAVEN! what a great cherry tutorial!! i'm so excited for cherry season, too. i only started liking them last year, so i'm catching up for lost time now!! I've been known to eat so many cherries during the season that I almost get sick of them. Oh, how I wish it were cherry season here in Rhode Island. Actually I don't think it's ever cherry season here, but cherries are one of those things I'm willing buy no matter where they come from, because there is really nothing like a bowl of cherries. I'm so excited for cherry season, too! We're actually trying to convince my mother in law to plant a cherry tree sometime soon. This salad looks great. I'm a sucker for anything with goat cheese! peterg-Maybe I should spend summers in Australia! ashley-Oh, I hope you do! giff-Aw, thanks for mentioning that. Maybe I will! lynda-Our strawberries are ending too. lisa-It's a winner of a recipe, so I can't wait to share it! pille-They're worth the wait though. heather-I'm glad you liked it. mark-Mangoes, oh, yes. Hope you try the cherries in a salad. They're amazing! Please tell me there's salad left for me ... OK well, I'll be off to the store to see if they've gotten fresh cherries in yet... none there on Monday but maybe today. Hey stranger, glad the cherries have arrived over there! I love them but too early for us. Hope life is good. What a great salad. I love cherries and I'm looking forward to your next recipe. I'm excited it's cherry season too. I stopped by the market and tried a few and they were soooo goood! I just love cherries. But anyways your recipe is amazing - I could just imagine how good it tastes. Can't wait to try it! Ooo, that salad sounds divine! Yum. Cherries are so worth the price; they're so darn good. It's hard to not just eat the whole bag plain. I can't wait to see the French toast you came up with! Exactly the kind of salad I love! A perfect one for me ! Wow! That looks fabulous! Such a great way to use cherries. For the rice vinegar, are you using a natural one or a seasoned rice vinegar? Gorgeous looking salad. YAY for cherries. Thanks for the cherry facts! That salad looks divine! Salad with fruit is such a great summertime meal. 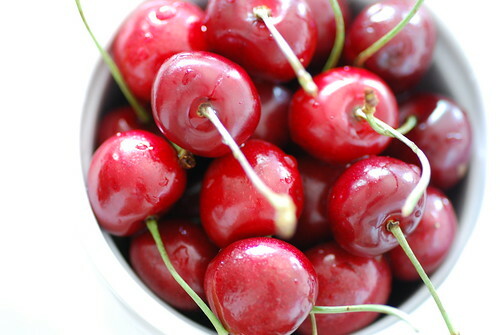 I would love to just sit and eat a whole bowl of those cherries. I might even be adventurous to sprinkle a chili-spiked sea salt on it too. Ouuu, I am drooling here. david-How's it going? They're worth the wait. desmone-Thanks so much. I appreciate that. sha-I'm so happy you like it. chris-I use unseasoned rice vinegar. cynthia-Chili spiked sea salt? Bring it on! acai-They pair really well together. What a georgous super salad! A feast for the eyes & mouth,....MMMMMMMMMMMMMMMMMMMMMMM!!! !